The Boat Warehouse stocks a wide range of Boat Covers. These covers come in a wide range of sizes for many different types of boat. It is important to follow some basic instructions when measuring your boat to ensure you get a cover that fits well. Measure the length of the boat from the tip of the bow (including bow roller, anchor, etc) over any fittings (such as bow rail, windscreen, seats or bimini) to the top of the transom. Measure the width of the boat at the widest point from one gunwale over any fittings (such as windscreen, console, etc) to the opposite gunwale. 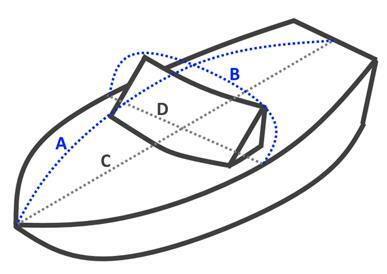 Measure the straight line length of the boat from the tip of the bow to the top of the transom. Measure the straight line width of the boat from one gunwale over any fittings to the opposite gunwale. Manufacturer’s labels cannot be relied upon for boat length. For example a Qunitrex 610 Offshore is actually 6.32m long. Every boat is different. So it is important to measure your specific boat accurately according to the above instructions before ordering a boat cover.